Here we are once again, discussing our NFL predictions. 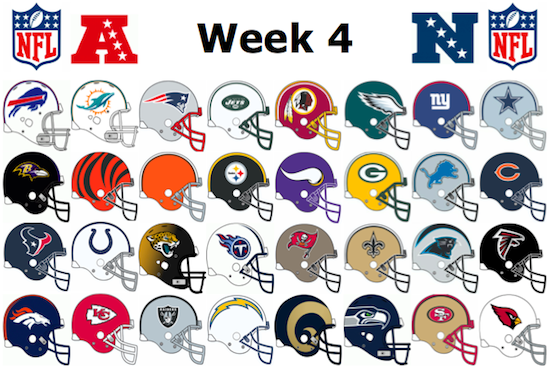 Week 4 is sure to be a tough one. Let's get right into the predictions. Week four is slated to be make or break time for a several pre-preseason favorites, such as my hometown Ravens. Here are my predictions for this week. Hopefully, my office pool picks do just as well as my online picks did this week. I expect to see some pretty good games this week. I missed a few here, yes but those games are pretty easy to see who will win. 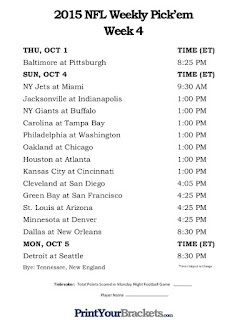 Week 4 should get kicked off nicely with a Thursday night battle between the Ravens and the Steelers. Features 4 potential rivalry games on Sunday. An interesting game on Sunday Night between the Cowboys and Saints. Concluding with a Monday Night Showdown between the Lions and the Seahawks. Bal vs Pit- Baltimore will finally win their first game. It will be ugly nonetheless. NYJ vs Mia- Miami will finally make the passing game work and resemble a respectable playoff contender. Chi vs Oak- Oakland looks better than expected, but they have going against weak defenses so far. They will get another win this week. 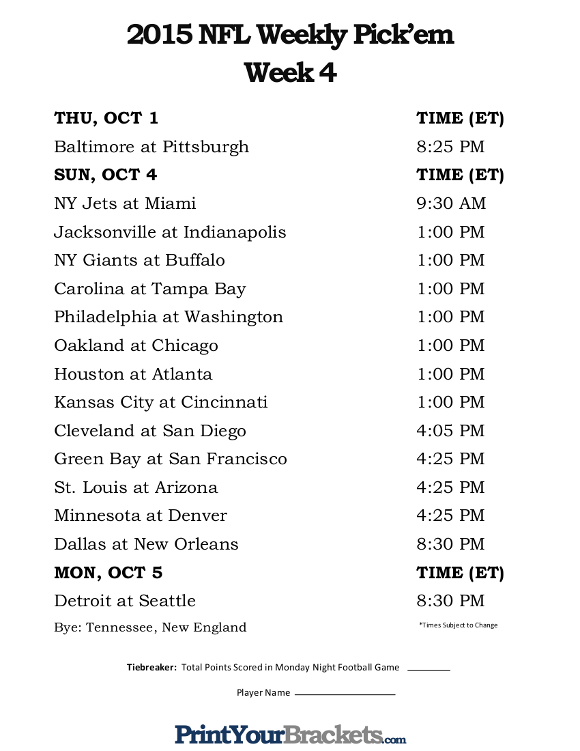 KC vs Cin- Cincinnati will get a Chiefs team just coming off of the Monday night game. They'll be ill-prepared and lose. Bengals win. Hou vs Atl - Atlanta. Too much Julio. Min vs Den - Den. With full control of the offense again, Peyton will excel in the shotgun and get a W.
Det vs Sea - Seattle will destroy these boys. What are your predictions? Post them in the comments below.